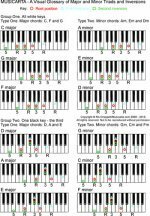 Time to get on and learn your symmetrical pentatonic melodies in E flat and A. These pentatonic scales have two black keys (always one fewer than the accidentals in the key signature). Transposing like this is a fun challenge, and improves your 'can-do' musicality very effectively. On top of that, you get to play the patterns from 'skeleton sketches' which just tell you how many scale-tones up and down the melody goes. This will improve your 'ear'. But first, let's drill our A and E flat pentatonic scale with a new scale-tone drill. The new scale-tone drill builds tones either side of the tonic (home note) in a recognisable, musical pattern. Here's the music in E flat, just for reference/to look at. You'll play stems-up notes with the right hand, stems-down with the left. 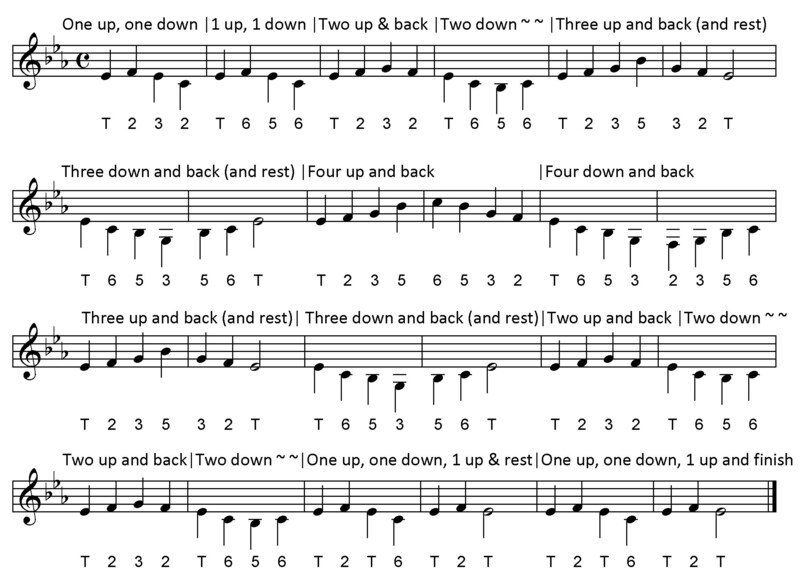 You see that it builds up from just one up/one down to all the way to four up/down and back, then back to one up/one down in a recognisable tune. You know the sound of the major pentatonic scale quite well now. Try playing the drill from the 'instructions' in the music above on your desk-top and singing along. You won't know what key you're in, but that doesn't matter. This video shows just the one up/down 'skeleton' instructions along with the audio of the build-up. Just listen once while you 'read the instructions', then repeat and try to play along. Here's the same drill, but played on MidiPiano so you have a visual cue to follow as well. Here are the same two videos in A. First, just the instructions plus audio, to see if you can 'get it'. Here's the video with the MidiPiano Piano Roll view. Be sure you can play the drill in both scales before going on. Only some of the patterns we've played so far have been used. Here are the instructions for the new 'Pattern One'. Have good look. It uses only the one up/down and two up/down pentatonic scale-tones. Hopefully, you could hum it from just the instructions. Here's the first pattern in E flat video. The first part of the video shows you the instructions plus the E flat pentatonic keyboard. It plays you the tonic (starting note), then counts you in, 1 - 2 - 3 - 4. You'll join in then and play along. Then the video shows the same pattern played on MidiPiano, both keyboard and piano-roll view - another chance to play along and keep up. Lastly, back to the instructions plus audio, in case you didn't get it the first time. Here's the Pattern One instructions table again. Can you play the tune from just the instructions now? Keep going though the cycle until you can play along reliably. Now the same pattern and the same procedure in A major pentatonic. Take this opportunity to become a more independent music-maker! Patterns Two, Three and Four are on the next page.